***I received the following game from Spin Master Toys for the purpose of this review. No further compensation was provided. All photography is original and copyright Momma Told Me 2013. Momma Told Me: Don't Pop It! I won't say I had a negligent, balloon-less, childhood, but balloons were not welcome in our house, let alone with the intention of being popped. 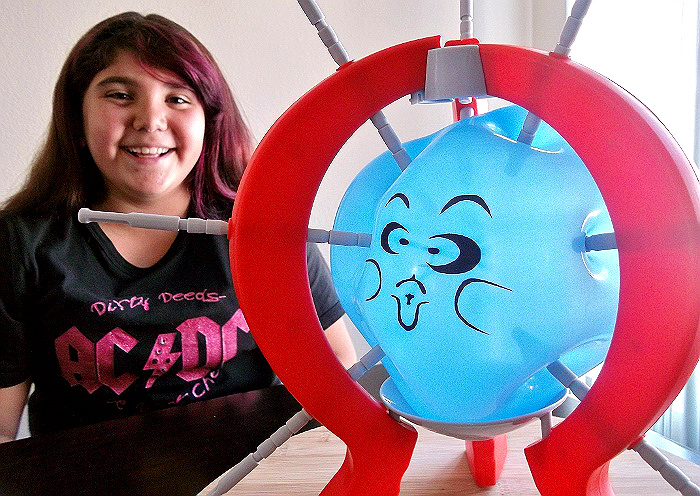 So, when I received a bundle of Spin Master's hottest toys for the 2013 Fall season, Sabrina (10) and I were both immediately drawn to Boom Boom Balloon. 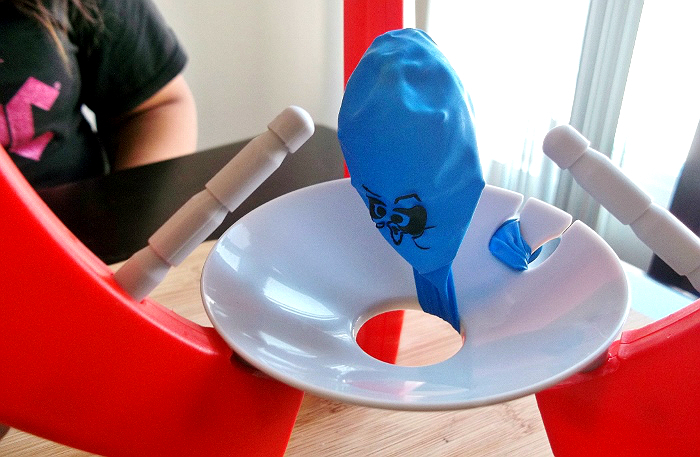 Classified as a Kids game for ages 8+, be mindful real balloons and rubber fragments are involved, this simple tactile game pairs wits with your child's first true anxiety experience, proving fun for the whole family. I'll admit, we had a blast playing 4 consecutive rounds of this game, but there were points I found Jay exclaiming, "Who thought up this twisted game?!" as he winced in expectation from the sidelines. But, what do you expect from a game that's entire premise is to poke a latex balloon until it pops? pop pout during game play. So the object of the game is simple. Inflate a balloon (there are 12 included with printed faces on them) into the frame and wrap it off (not tie it), at the bottom base notches. 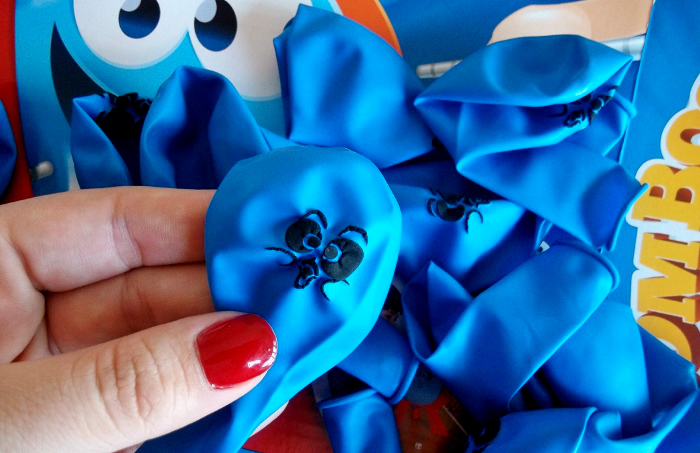 I have a theory the lack of tying, and the balloons manufactured to go with the game, offer a less traumatic pop, and tendency to withstand some abnormal amounts of pressure. In any case, 9 plastic, dull, pins are then inserted into the holes around the game's frame. Players take turn rolling a (1-3) dice to see how many pushes/clicks they will have to complete on their turn. Each push pin has multiple notches that will 'click' as each push is completed. They have ridges to create pressure which also keeps the pins from popping back out once clicked in. In the beginning Sabrina (10), and I were the only ones playing, because the premise of a game in which the sole purpose was to create a loud unexpected noise thoroughly terrified Jay. Sabrina also began by throwing away her '1' click rolls, opting for a higher 2 or 3, because she was so excited to see the grey poles protrude through the latex. I'll admit, it was a little fun to see the balloon face get warped and strained, but the stress did begin to build as progressed. We played atop our Lazy Susan on the dining room table, which proved convenient for players to easily turn the game without disrupting the other pins. And, I dare say, some education was had on the topic of pressure as we gently touched the surface to judge the balloon's 'give' before each click. 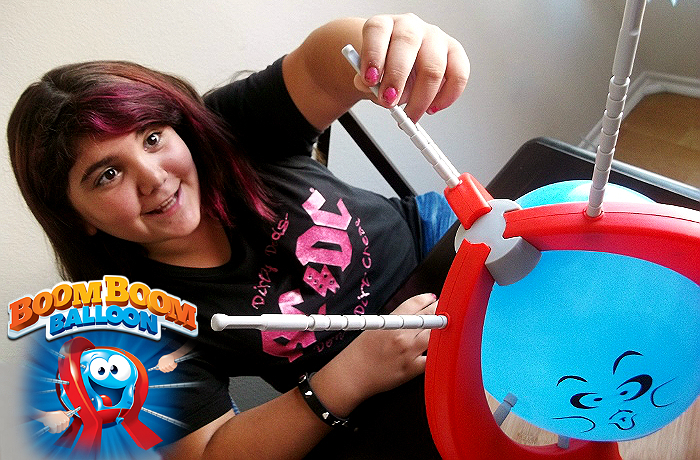 In all, Boom Boom Balloon was a fun game Sabrina couldn't wait to play with her friends. Once you've run out of the included 12 balloons, other latex balloons may be substituted; just be mindful of the air capacity and resistance of varying balloons. 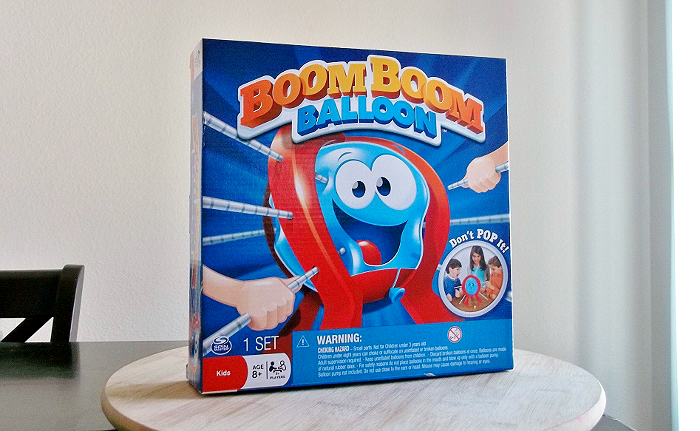 Boom, Boom, Balloon is currently in stock at Toys R Us for $15.99, and other toy/game retailers nationwide, on and offline. While this game likely is not appropriate for kids younger than 8, though they will surely be mesmerized by the concept, it would make an especially great party game for tweens to adults. AAAAAACK! A parent's nightmare and an aunt's greatest gift. Thanks for perhaps finding me my next gift for my nephews. I must have this. HOw great would this be at the Holidays. I am going to PM you and get the really gory details. Looks so fun. Can I buy it on Amazon? That is so cool. My kids are obsessed with balloons and would have a blast. I have to say I agree with your mom. 10 seconds of joy compared to the heart ache that followed when a balloon popped and the good time was over was not a fair trade and I was the one left wiping the tears. This game looks so cute and I think my grand kids would like it. It is certainly sold on Amazon, Shelley! I've also seen it at my local Walmart, though I'm not sure if it's stocked online too. This would be so fun at a party! 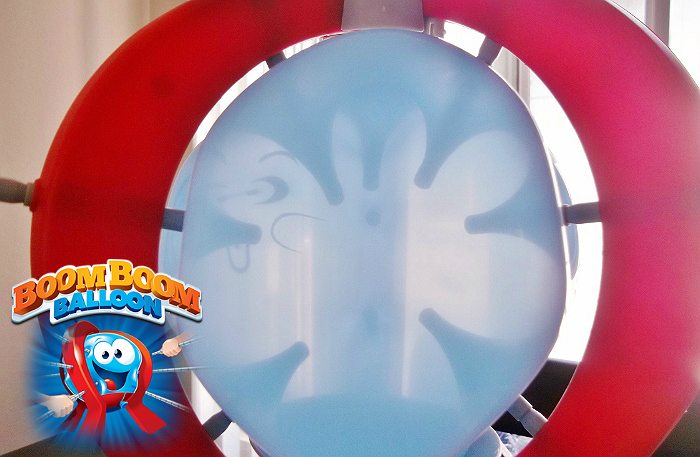 The kids can't keep their hands off balloons, they'd love this. I would be cringing in the corner; that popping sound always makes me jump even when it's anticipated. That is an awesome game! It is something my kids would have a blast playing! 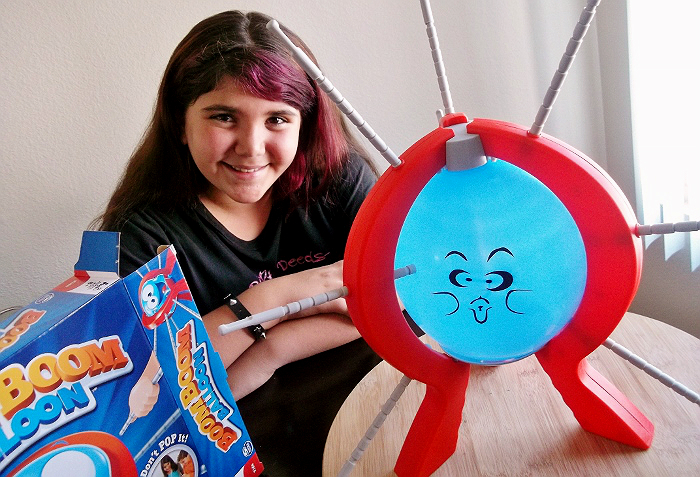 And a huge hit for a birthday party game or having friends over! MY KIDS WOULD LOVE THIS! This is totally something they would go gaga over! Well that is certainly neat. I have never seen anything like that before! Ohh this is gonna be perfect for our Christmas party! We always try to do fun games like this! This looks really cool. I think I'll get it for our next family party. this looks like such a fun game my family would have a blast playing! Your mom's view is totally valid! All balloons do is make kids cry. Every time. EXCEPT this game! 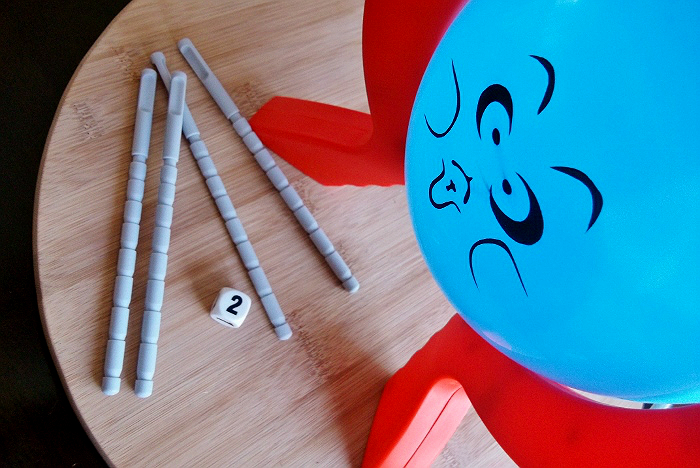 My kids love this game and a balloon popping followed by happy squeals and "let's do it again!" Winner.